THIS JUST IN! Did you see the headline? It’s worth a read, if only because their graphs and charts are prettier. Enjoy. 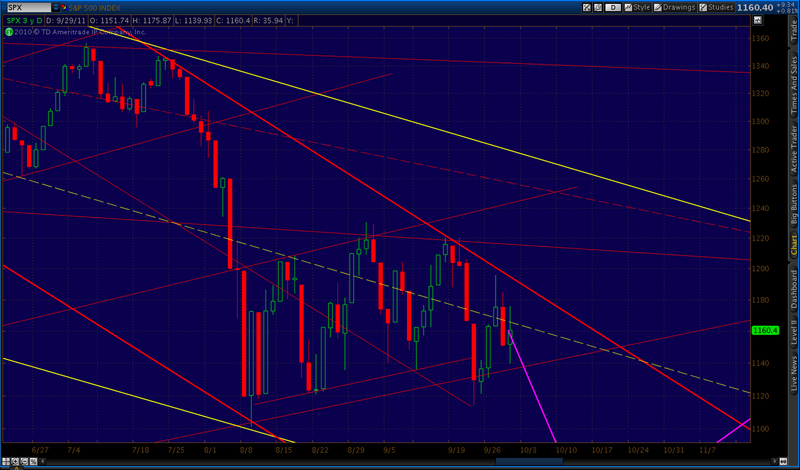 I think I’ll post the Path to 350 chart as the last chart each day, just to keep an eye on it. If you missed the post and have an extra hour on your hands, here it is. If you read nothing else on this blog, this is the one — the Big Kahuna, Grand Poobah and Big Cheese all rolled into one. Let’s see how many days in a row we can go without it being painfully obvious just how serious my dain bramage is. 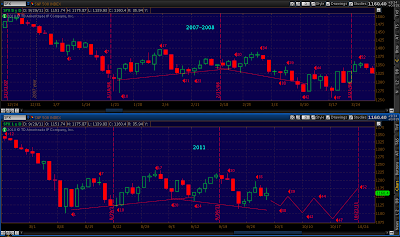 Seeing a little divergence in the 2011 v 2008 analogy. 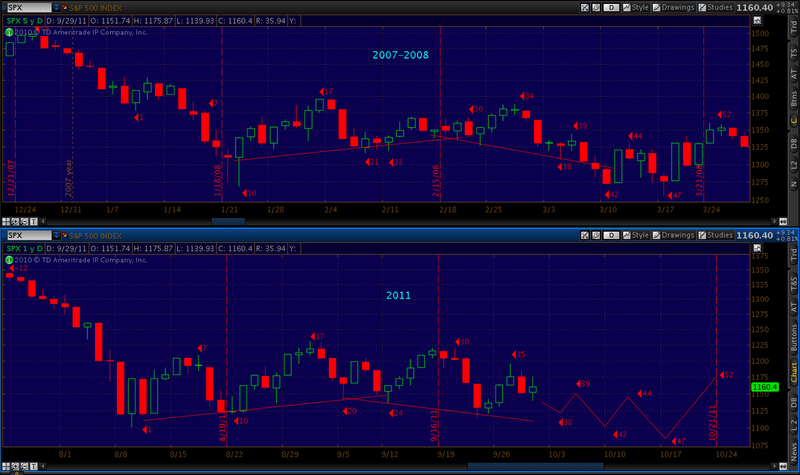 Might be OPEX issues, but in 2008, day 34 made a higher high from day 30; in 2011, 30 to 35 made a lower high. We’ll see how it plays out over the next few days. Looking at the open interest in SPY puts, I would imagine market makers and dealers are pulling out all the stops to keep the markets at these levels. Given the way things work these days, that probably means our “tax money at work” in the form of the Plunge Protection Team. Certainly had that feel, today. The lines in the last few days of the 2011 chart, BTW, aren’t meant to convey a price objective — just tracking expected time and direction. 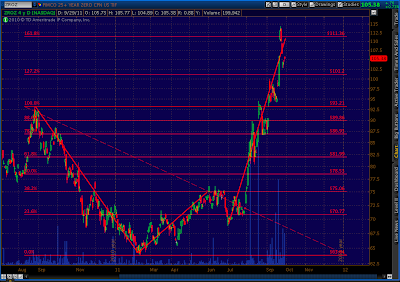 This is Pimco’s 25-yr zero coupon ETF, (ZROZ.) I don’t follow it, but came across it today while researching something. The Crab Pattern jumped out at me. It reversed just above the 1.618 extension, and seemingly has further to fall — maybe on the order of 20% or so to just the .618. The portfolio’s duration is 27.79, so a 20% decline in prices would indicate a yield increase of 0.72%. 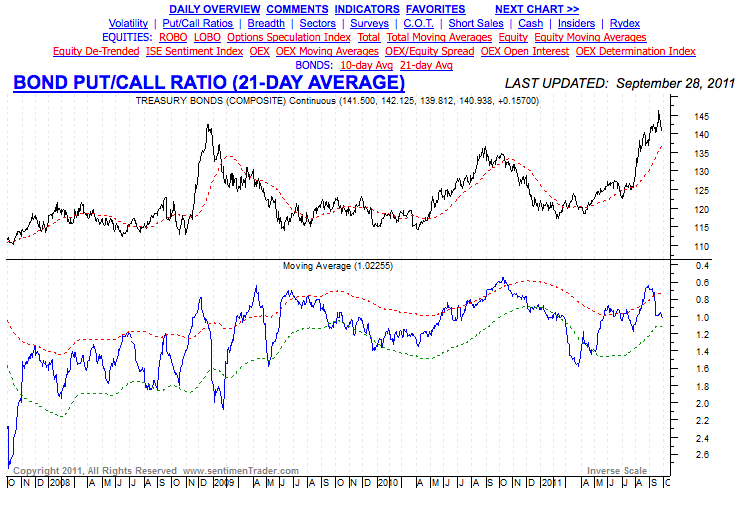 Anything could happen, but a .72% increase in long bond yields would hardly be beneficial to stocks. Of course, other factors can drive down prices — credit quality, for instance. 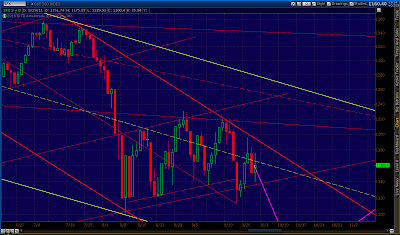 We are talking US treasuries, after all. And, let’s not forget currency fluctuations. A crash in the dollar wouldn’t do much for the value of long-duration dollar-denominated assets. 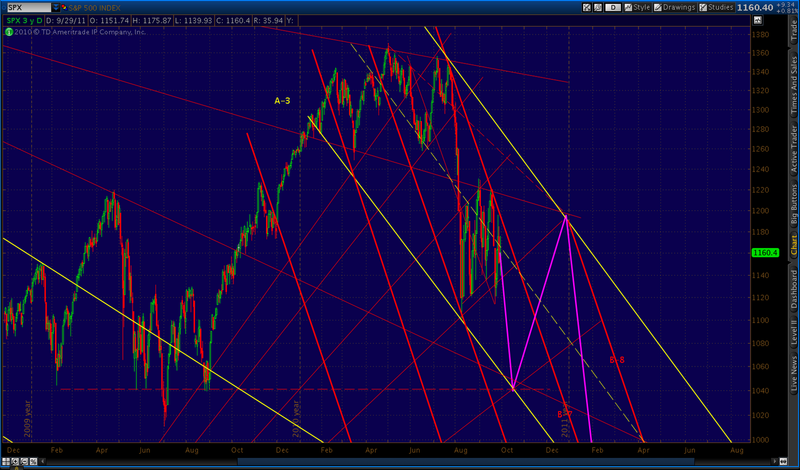 Come to think of it, none of these events would be beneficial to stocks. In an “all-the-same-market” scenario, bonds will tank right along with stocks and commodities. Wait, you say, didn’t the Fed just commit to a twist strategy that would boost long term bonds and lower rates? 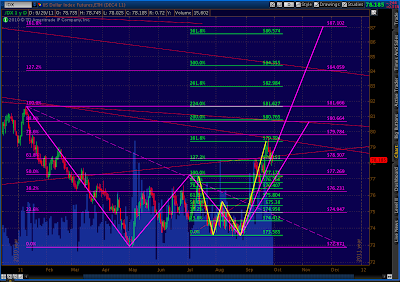 Surely, that would allow bonds to continue their ascent? 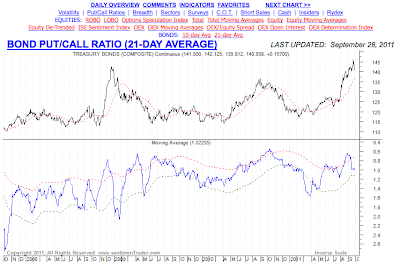 Take a look at a cool SentimenTrader.com chart, which shows bond sentiment at extremes. Nowhere to go but down. As discussed in yesterday’s The Path to 350, a rising interest rate environment would be the nail in the economy’s coffin. Conjoined Head & Shoulders, anyone? We all know the dollar needs to soar in order to get a decent stock dump, so how do we reconcile the dollar’s drop with SPX’s coming 5th wave down? 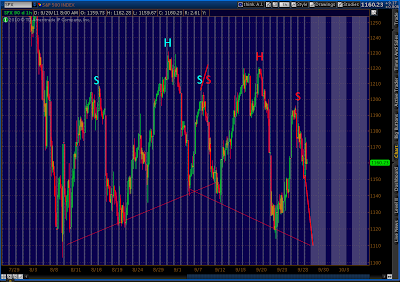 The dollar (DX) has played out a beautiful little Crab Pattern over the past two months. It reversed right at the 1.618 as expected. It’s the pattern in yellow, below. But, note that that Crab Pattern takes place wholly within the C and D legs of a much larger Crab Pattern that began last January (seen in purple.) 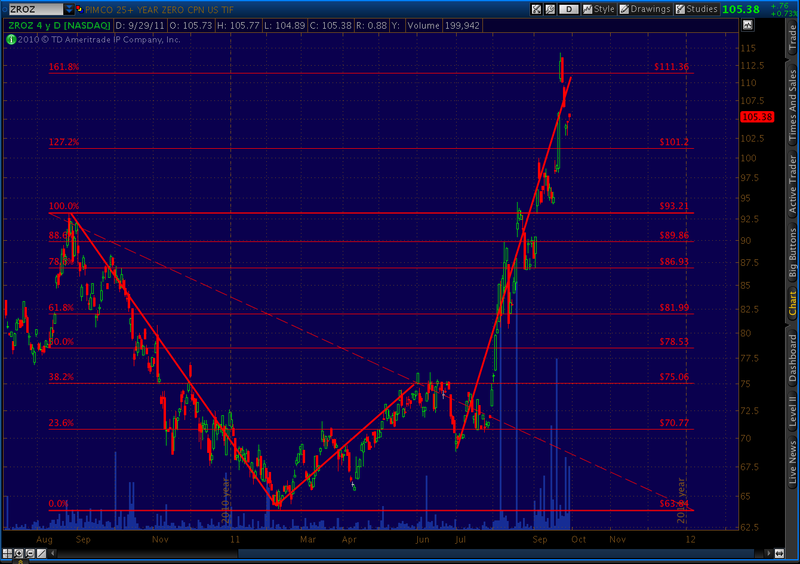 Its 1.618 extension is at 87, a whopping 11.3% increase from here. It doesn’t have to be a Crab, by the way. 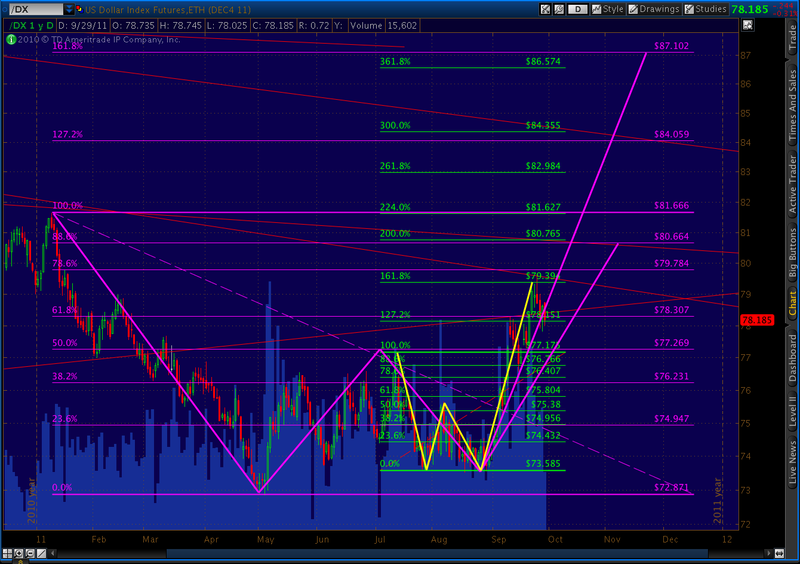 Bat Patterns also accommodate a Point B at the 50% retrace. 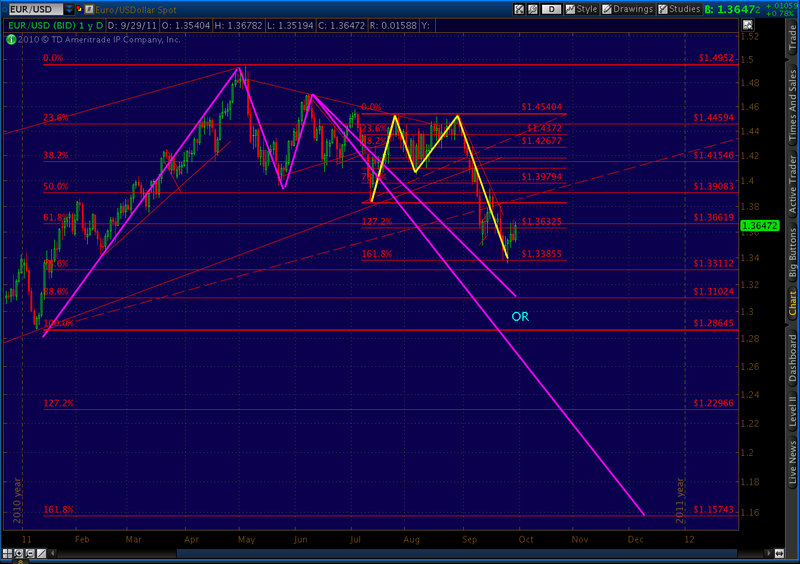 Instead of extending to 1.618, they reverse at the .886 retrace. Even that, though, is 80.664 — a still healthy 3.2%. My guess is that we’ll see 80.6 with this wave 5 down, then a retrace while Minor 2 works itself out, followed by a rocket to 87 to coincide with Minor 3. 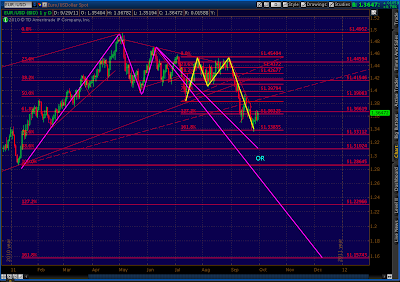 EUR is in the same boat, BTW. Well… we should know pretty soon. Of course, "most bearish I can recall" doesn't mean we've maxed out on bearishness. 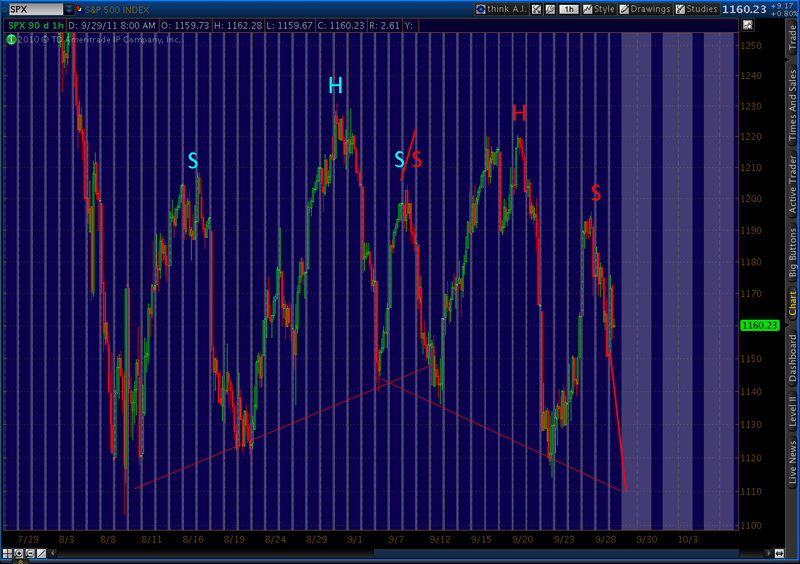 I think that's the nature of a wave 5…just when you thought it couldn't get any worse, it does! 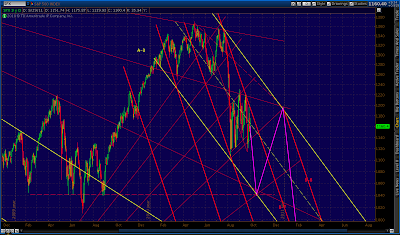 Then, and only then, capitulation and rebound. That's my take, anyway. But, the next week or so should reveal all. Good luck.